This hotel has been on my radar for some time. Las Casas de la Juderia is just what it says – houses in the Jewish quarter. It’s a conglomeration of five ancient houses interlinked to form one hotel by a maze of corridors and patios. I loved it just as much as I had yearned to go. At the beginning of March with very pleasant weather (unlike now) hubby and I headed east from home in Jaen to Cordoba city, a drive we always enjoy with completely different scenery than our mountainous, olive-tree covered province. Heading towards Cordoba the landscape flattens and the road cuts through rolling hills of crops and sunflowers ( but not in March!) We were planning to take the car to the hotel door and let it be parked for us, but had spotted parking and left the car just around the corner from the hotel, city walls and the Royal Fortress. Being shown to our room I was itching to get my camera out, looking at all the gorgeous nooks and crannies, and not paying attention to how to retrace our steps, that was a mistake. I only learnt later as we were being shown some other rooms that each of the five original houses were painted in different colours, which, the porter told us, is very handy when guests get lost! We didn’t have to phone and be rescued but the layout is intriguing. If you’re nosy like me you do a reccy, get lost, find your way and take a lot of photos. The hotel made up from 16th and 17th century houses with gardens, patios, fountains and architectural gems is delightful. If groups of guests stay, they can all have rooms in the same coloured house, with its own patio, making it easier to find each other, I fancy that. Charm oozes, history charms, patios call and fountains soothe. I could have stayed for a looong time, with camera in hand, but Cordoba too beckoned. At just one minute walk from the hotel is the Mezquita in one direction and the Alcazar in the other the situation is perfect. Not too close to the hoards, but in the narrow, cobbled streets of the Unesco listed historical Jewish Quarter. Because of the patios and passages you wouldn’t imagine the hotel has more than 60 rooms, it has a very charming, welcoming feel. Did I say I wanted to stay? The lounges, one with an honesty bar next to the reception and the other with architectural finds on display, are as welcome for relaxing as the outdoor areas, which may just get a little too much in the heat of the summer. If so the pool is ideal for a cool down. Ideally placed for a night-time stroll along the river and tasting tapas at the bars or formal restaurants. The hotel doesn’t have a restaurant but groups and functions can be catered for in the lovely atmospheric dining room. We walked around the now, emptier streets and tasted and tested a few tapas. My favourite and one definitely to be sampled as it is supposedly from Cordoba is Salmorejo, a thicker, tastier cousin of Gazpacho, more a dip than a soup. There’s even a street named after it near the hotel, and the bar at the end is a good choice. Breakfast was very good, buffet-style with laid tables in the lovely restaurant with original parts of the ancient city walls. Sadly our one night stay passed all too quickly, Hotel Las Casas de la Juderia will be recommended to my trip planning clients and we will be back to Cordoba again and again. 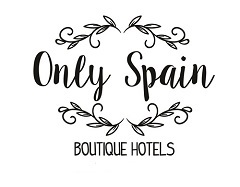 Casas de la Juderia will soon be on Only Spain my Boutique Hotels and B&Bs in Spain sit.